Let’s be real, most people do not floss often enough. The American Dental Association (ADA) strongly recommends flossing at least once a day. Brushing does not remove all plaque from your teeth. Food and other debris lodge themselves in between your teeth and in your gums which causes plaque. Flossing will help you prevent plaque from hardening into calculus or tarter which causes gum disease. Please keep in mind that prevention is always easier and less costly than treatment. Oral care is more than just brushing your teeth and seeing your family dentist twice a year. Flossers are usually disposable, y-shaped pieces of plastic that have floss tightly strung across them. They come in many different shapes and colors and can be purchased at pretty much every store that carries toothbrushes. They are definitely better than not flossing at all, but since there is no slack, they don’t wrap around your teeth or reach under gums like traditional floss. An air flosser is a device that uses compressed air to spray water or mouthwash between teeth to dislodge food or other particles and remove plaque. Studies have shown that, unlike the flosser mentioned above, air flossing is as effective as traditional flossing methods. Water piks are powered devices like air flossers, but instead of air, they use a stream of water or mouthwash. This method is called ‘water irrigation’, and it’s been shown to be very effective. They can be used by everyone, but are particularly effective for people with braces or teeth that are difficult or impossible to clean with floss. At Halonen Family Dentistry, we have been a Battle Creek dentist office for nearly forty years.. We strongly believe in preventative maintenance when it comes to your oral health. 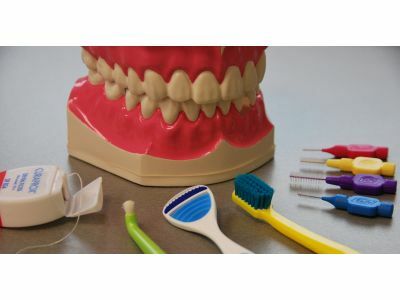 Unfortunately, gum disease is extremely prevalent even as flossing options grow. It is crucial to your health, dental and otherwise, to find a flossing regimen that works for you. Call us today with any questions or concerns you may have, we look forward to hearing from you!